Merchandise that's made available online for your customers to purchase directly from us, just one item at a time -- with no cost or fulfillment involvement by you! We do the work -- you pay nothing! 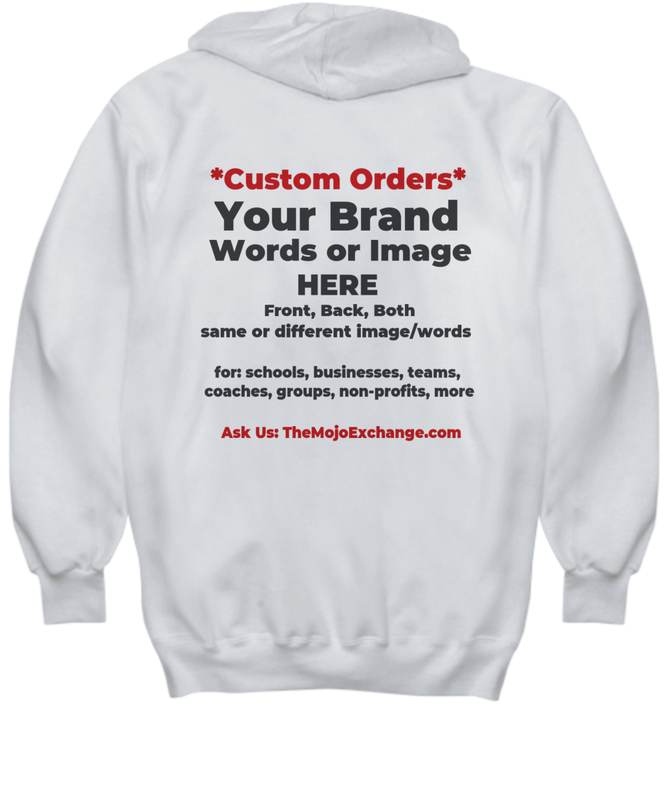 How would you like to have YOUR brand or slogan in the hands of YOUR clients, customers or friends -- on the t-shirt they wear to the gym OR the cup they use for their morning coffee -- and... have that happen with NO COST to YOU, and almost NOTHING to be done by you or your team, to make that possible? 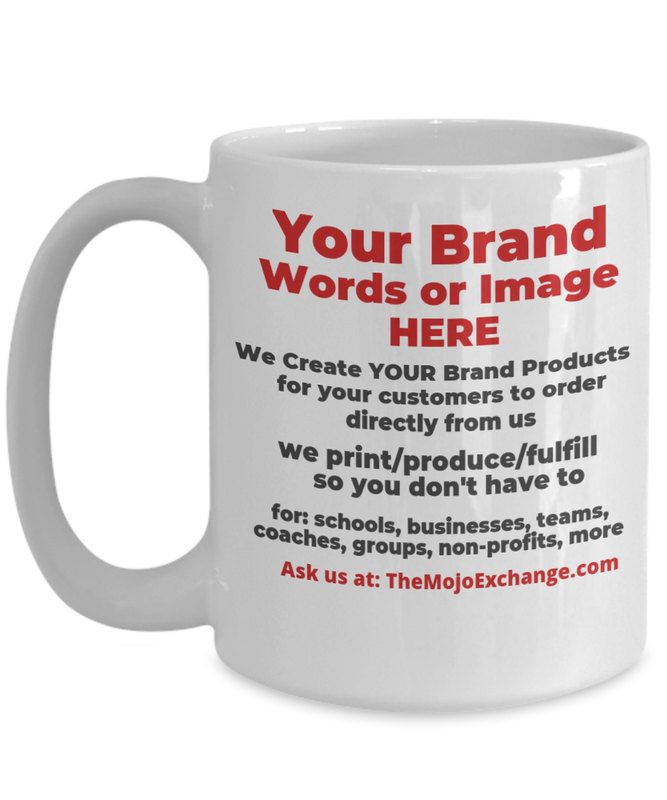 Welcome to "Just for You" Products: The Mojo Exchange Exclusive Custom Product Service for Entrepreneurs, Coaches, Business Owners and Organizations who want to share their message with the world, far and wide. We create YOUR branded goods to give the people who love YOU the ability to purchase their own items directly online, even if they buy just one item at a time -- WITHOUT involving you, your resources or your team's efforts. That's right. It's crazy easy and simple. Coffee Mugs... T-Shirts... Posters... Necklaces and Bracelets... even More. All items are printed, on demand, in the USA. So a customer can order just one item, or many. Your followers, friends, clients and fundraising supporters get to buy directly online from our store, and you get the great advantage of having products available with YOUR brand or favorite slogan printed on them, for your people to buy... and YOU hold *NO* inventory, *NO* storage... you do almost nothing to make it happen, and there is NO cost to you. AND... you get to *receive* the great benefit of your people holding YOUR name, brand or slogan in their hands, on their morning coffee mug... OR... wearing it on their favorite T-shirt. You get to have simple products with your branding or slogan printed on them made available to your people without doing almost anything to make that possible. You get incredible free exposure, in the homes and lives of your people, with items that hold YOUR name or content, as you choose. You get this done with no purchases, no holding any inventory, and managing none of the process, and in fact, paying for nothing. You get loads of exposure having products in the hands of your people with YOU on them -- and, you get the great advantage of them *thinking of YOU* every time they use that item! All you do is give us permission to print, provide a clean copy of your logo, slogan or words you want to promote -- and we take care of the rest. THEN... When the products with your branding are ready for purchase online, within a short few days, we provide you with PRODUCT LINKS that you share with your people, on your website or in your social media. That is it! Your people (the customer) gets to purchase mugs and T-shirts or other items, from "their favorite" coach, business or friend (YOU) with the brand or motivating inspirational slogan on it that has helped them so much in life. They get to purchase their favorite item, that reminds them of YOU, right online and have it shipped directly to their home or place of choice. They get to have reminders, IN THEIR HANDS every day, of the great inspiration YOU have delivered into their lives through your work. They get the mental prompts they need, to stay focused and keep on track with the wonderful work you have shared. And they get to have those prompts right in their own hands with a T-shirt, Coffee Mug, Necklace or Bracelet, Poster or other item, to help them with simple "mind cues" that keep them on track. 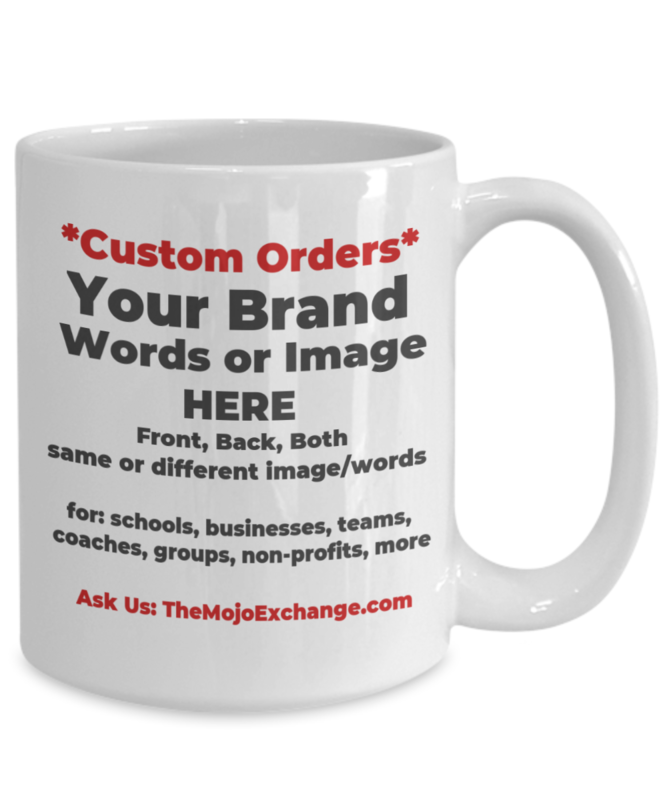 The Mojo Exchange and our vendors -- the ones who do the design, print, produce, package, process and ship these items that are "your" products -- we make our revenue from simply selling the products. Products that advertise YOU. We would love to help YOU, do THIS. Just get in touch with us right here, and we will help you right away. It's so easy. To review current products available for custom orders, visit this page -- and, ASK if you don't see what you are looking for. We often have specialized options not openly advertised. Good for YOU, Good for Your Brand, Good for Your People! Call it crazy-free advertising that literally puts YOUR brand into the hands, and on the backs of YOUR favorite followers -- AND -- helps THEM remember all the GREAT prompts they've learned from you, to hold true in life. It is SO easy! Aside from the great win-win-win already evident... how about this: What do you suppose happens EACH TIME your people see YOUR NAME... in their hands, on their mug, t-shirt, poster... etc? Yes. They think of YOU. They are reminded of YOU and the great support you have been in their life... and... they want MORE of YOU! Just think... your people drinking their morning coffee from a cup with YOUR words of wisdom on it... putting YOU right in their HANDS, at home on a daily basis. How much do you suppose that might put YOU "top of mind" for THEM? And... what about THEM? How GREAT is it to help them have the GREAT pick-me-up phrase that you like to use... to help them throughout their crowded day to REMEMBER the tools and great advice -- the prompts -- that you've have championed to help navigate their days and life? This is great for YOU -- and -- it is great for THEM! Print on Demand makes it all work. And, WE at The Mojo Exchange are specializing in processing it all, FOR YOU. See... back in the old days, if you wanted printed "premiums" -- goods to sell or give to your customers to promote your brand or favorite slogan -- you had to spend a lot of time and money -- on design, production, inventory, shipping, handling... AND THEN... process all those orders with LOTS of staff time doing all the work! Well, now... THAT has all changed. 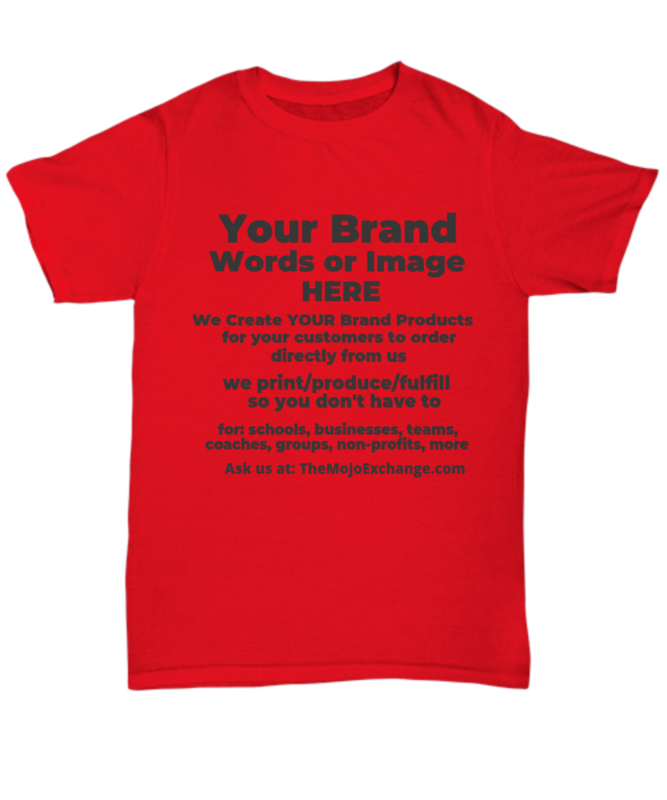 Here at The Mojo Exchange, we work with one of the best print-on-demand online service providers, to produce and process all products. We do the design work, with your permission and guidance, and our vendors do the processing and shipping. It's SUPER simple. And, a tremendous beauty in this system is that each product is printed "on demand" when it's purchased. So no one holds inventory. We let the customer (YOUR peeps!) make their request online -- with their purchase -- and then, all the processing is handled automatically by us, from there. 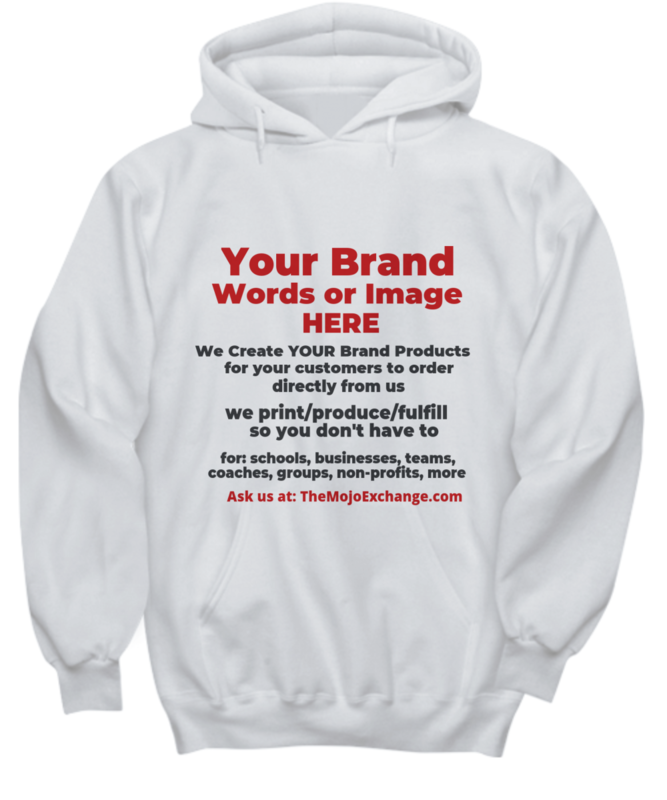 The only point at which you need to be involved at all, is at the very start, engaging with us at The Mojo Exchange to provide permission-to-print, and electronic print-ready logo art, OR, indicate the slogan words you want us to capture in a word-design, for you. We will design your goods using the inspired words, or logo graphic, you give us. If you have specific fonts or colors that are critical to your brand, you will provide that for us, with your details. That's it. There is no catch. It is SO simple. Here at The Mojo Exchange, we make this easily possible for you. You get to get YOUR BRAND all over the place -- literally IN your people's hands -- at no cost to you, and YOU do nothing but give us permission to print, and send us your logo or tag slogan/words... THEN... when the products are ready for online orders -- within a few days -- you get to share the link with your people and they get to buy. It's that easy. If YOU want to get in on this... OR... if you have questions... please get in touch! Just use our CONTACT FORM RIGHT HERE and we will be in touch with you right away! Thank you so much for being here. May we ALL keep the positive Mojo -- flowing and growing -- in everything we do!